It is October 21st, I wake up in a hotel room in San Francisco and like every morning, I read the Whatsapp messages on my phone. There is one message that makes my good mood of that morning disappear; a message from my father stating that my cousin – who shares my age – has chosen not to continue his life. Suicide is often considered a choice. But is it really? Suddenly the third pillar of Movember – reducing the number of suicides among men – becomes a lot more relevant and more personal. How can I contribute to that pillar? I remembered that MoRunner Hans van der Lans has good contacts at the VUmc and ask him if he knows someone who I can interview about men’s mental health. After several attempts and emails back and forth, he doesn’t succeed in finding someone, but offers to talk about something he hasn’t shared with many other people: his own struggles with the thought of suicide. Let's start from the beginning. You are already quite active for Movember. What does Movember mean to you? "For me, Movember is a lot more than just not shaving your moustache. I’ve been involved with the Foundation for some time already because of my love for rugby and ice hockey. For me it’s the month in which we draw attention to prostate cancer, a male disease, which gets very little attention right now. I believe that a standard check-up from a certain age – such as available to women – would be a good initiative. There is, of course, money and political support needed to do that". What role can the Movember Run play in that discussion? "You guys can make it clear that prostate cancer is a disease that needs more attention. Men keep this for themselves, it is something that will stay in the private sphere, even though it has a major impact on men’s lives. 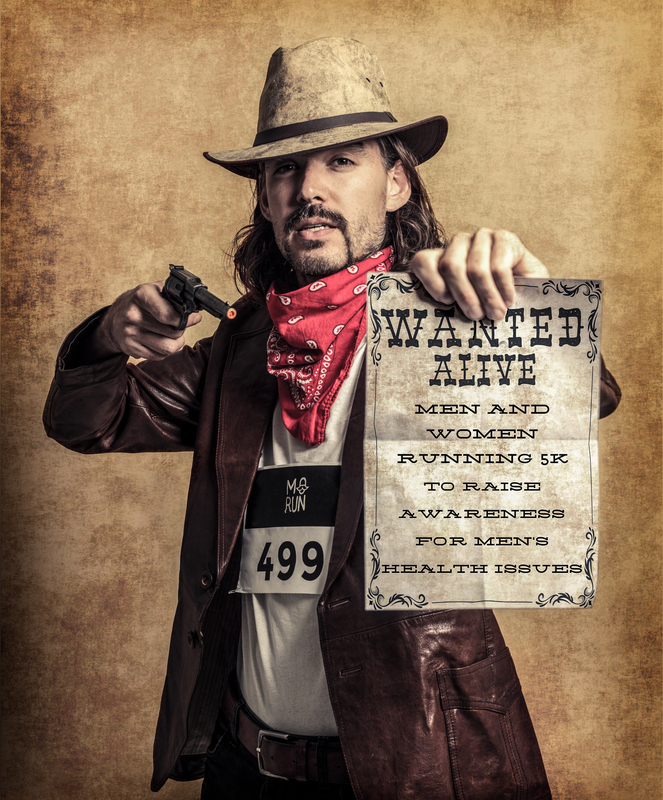 By drawing attention once a year through a Movember Run, or any other initiative for that matter, you create a wider platform, so more people will give attention to this topic. I just think that once a year is too little attention though". Prostate and testicular cancer research have traditionally been important pillars for Movember. Last year and this year again, there’s more attention for men’s mental health. What do you think of this addition to the Movember cause? "I find this very important because men talk very little about their mental health. Because of stress at work, or private circumstances, many men suffer from burn out, or at least, go into a downward spiral. That still leads to too many suicides. So, it is very important to draw attention to this, show men that it’s possible to choose differently, and show that there are people you can trust. That really helps enormously". At first glance cancer and mental health are two very different diseases. Are they really that different, or can you also see many similarities? "The similarity for me is that they both get too little attention and that is why Movember’s work is so important. The big difference is that cancer, which I think is a terrible disease, receives a lot more understanding from people. Depressions and suicides absolutely don’t get that understanding". Why do you think that depressions and suicides don’t get the same understanding? "I find that hard to answer. When someone gets cancer you can't speak of 'guilt'. It’s a terrible disease, and you wouldn’t wish it to anyone, not even to someone who has smoked for years. Also, the treatment of cancer is visible; people are visibly sick and in many cases lose their hair. In the case of mental health issues, people often say that you’ve been working too hard, so in a way, you do it to yourself because you haven’t looked after your own interests enough. With psychological issues you also put a burden on others. Especially if you are severely depressed and suicidal, which can easily lead to misunderstandings. If you’ve never felt that way, you can’t imagine how bad it is. I think that’s where a large portion of the misunderstanding comes from". I think you are showing a lot of courage to share your personal story with us. Why do you find it important to be so open about it on a medium that reaches so many people? "This is not easy, believe me. There might be people who are concerned, who don’t want to talk to me anymore, but I will get over that. This is important, because my story ends well, and with it I can maybe help someone who is having those bad thoughts at this moment. If I can help one person, I’ve achieved my goal. It's time to show that hiding yourself is bad for you, and it’s important to speak about this openly. By sharing your story, you show the world that you’re strong and have the courage to be open about it. Because there’s hope, also for those who are feeling bad”. We probably underestimate the number of people suffering from this problem right now, and I’m sure your story will be the story of many. Would you like to share your story with us? “My suicide attempt was on January 23rd, 2013. It is a long and complicated story that actually started back in 2006. During that year I was seriously ill and a day before I had my surgery, my employer told me that I didn’t have to come back. Fortunately, six weeks later, I found a very nice job as a Finance Manager at a German company. I worked really hard for 3 years, so hard that I was close to a burn out. My parents started needing my support, so I wanted to work from home more often so I could look after them. The company was not in favour of this though”. "I searched for distractions and stress relief and found these at a fitness center. I had a great time doing sports, and this is where I developed my interest for running. However, this is where you find the immediate cause for my suicide attempt. I had trained with someone I deeply trusted for two years, and considered her a friend, but after a workout I was told that she didn’t want to see me anymore. That was tough. I didn’t understand what I had done wrong, as nothing had ever been said to me”. "I was already depressed by all that had happened and was struggling to find work. I felt that I should have been given a second chance, but couldn’t get in touch, and couldn’t do sports anymore the way I was used to. I continued running. October 2012 should have been my first full Marathon, but I didn’t dare to do it on that day. This was a huge disappointment and I ran an emotional half Marathon". How do you recognise a depression? "People with depression are lethargic, numb, show a loss of interest, can’t find any rest, have difficulty in taking decisions, and a sense of guilt and worthlessness. In the worst case, there may be heavy fatigue, reminiscent of death or even planning death". The question that remains for me is, is suicide really a choice? If people consider it a choice, that will probably explain why it’s still a taboo. What do you think? “No, I don’t think it’s a choice. Of course I chose to bring a knife, but if you feel this bad, there’s no choice. You don’t want to feel the pain anymore, you don’t want to be alone, you want peace which you’re hoping to find by ending your life”. How important is your family in that particular moment, and do you think of them when you are in that situation? “Of course that depends on the relationship you have with your family. Yes, I did think of my family. My daughter was an important reason for me to choose life, and also my best friend was an important reason. The response to suicide you often hear is, “how can someone do this to his/her family?” What these people don’t understand is, that the person who is considering suicide also doesn’t want to have these feelings. But he or she sees no way out and feels let down by everyone”. I know my cousin received a lot of support from his family while he suffered from a manic depression. How can outsiders offer support to people who consider suicide? "If you have the suspicion that someone is thinking of suicide, the first question you have to ask yourself is: Can I help this person, and do I want to? The next question is: can I inform anyone else? It’s very important to know how to deal with this matter, because for the person in question it can be quite stressful too. The website 113.nl has many tips that can help you further”. “It’s still difficult to fully understand how someone thinking of suicide is feeling. Sometimes 5 minutes can make a difference. If there’s no one there at that specific moment – or to be more precise, if the person feels there’s no one; in a moment that he or she doesn’t want to be a burden to others anymore, when he or she feels left alone – then 5 minutes can be enough to undo days, weeks, or even months of therapy”. Shouldn’t we leave it all up to professionals then? Can we still do anything? “Certainly, families and friends are very important as I mentioned. Ask yourself the questions: can I help, do I want to help and how can I involve experts? A GP and the GGZ (mental health care in the Netherlands) are first-line help services. GGZ, for example, has three 24/7 help lines that you can use. Telephone on Recipe (TOR), will offer support by phone; Chair on Recipe (SOR), will offer a 1-to-1 conversation; Bed on Recipe (BOR), can offer a stay for one night. All three options offer personal support. I would always recommend getting professional help, but I think many people will find it hard to talk to strangers about certain things. The combination of professional help and help from people that are close to you is always best. Support can be simple things like going for a bite together; you don’t always need to talk about the issue, as long as you show that you care about the person being part of your life”. “What I generally miss in these cases – and that goes for people dealing with cancer too – is aftercare. Not only for the people dealing with these diseases themselves, but also for their loved ones. When you are labeled as someone who has been cured, all support disappears, even though sometimes you need more support six months after a tragic experience”. Is that something Movember can help fight for? “Perhaps, but I actually think that we should all fight for this, not just the people who are committed to Movember”. Can you protect yourself from depression? “No, because there will always be setbacks. I can only talk about my own situation, but in 2012 I had trouble trusting people. Until by chance, I made a new friend, thanks to running. This nice lady was the face of the TCS Amsterdam Marathon in 2014. We were both part of the 7 original TCSSuperheroes. We got to know each other and became friends. This year, we will run the London Marathon together, and she was with me when I had to decide not to start the Marathon, as my health wasn’t good enough at that time. Also, there’s a very good friend who will be in my life for 20 years in May 2017, and with whom I share all my secrets. Despite the physical distance, she is closest to me”. "What I'm trying to say is that it’s important to talk to the people you trust. Unfortunately, that’s not all your friends, but I can promise every man that there’s someone in your life who cares about you. I know who I can count on, if necessary”. How did you find a positive response to your own struggle? “Actually by openly sharing my decision here now. There are very few people who know about my struggle, and this is – of course – very scary. What will people think of me at the Movember Run?” Probably that you are a hero to share this! There are many people struggling with this, and you have surely inspired them. Is there anything you would like to say to those who are experiencing these problems now? “I want to let them know that there are professional organisations that really want to help them. There are, despite the feelings of loneliness and desolation, honest people out there who care about you. Choose someone you trust and talk about your struggles". Thanks again for your inspiring words, Hans! If you think that Hans’ story deserves more support, please donate on his Movember page and help him raise more money for men’s health! Reproduction of this article is not permitted without explicit permission. Photography TCSSuperheroes and Movember Run Amsterdam. Do you like the Movember cause, but are you unable or unwilling to grow a moustache? Make your own contribution by signing up for the Movember Run Amsterdam! Sign up now!